Constructed between 1936-37 within the remnant walls of the nineteenth century Planters Hotel, the Dock Street Theater stands on the site of Charleston's first playhouse. 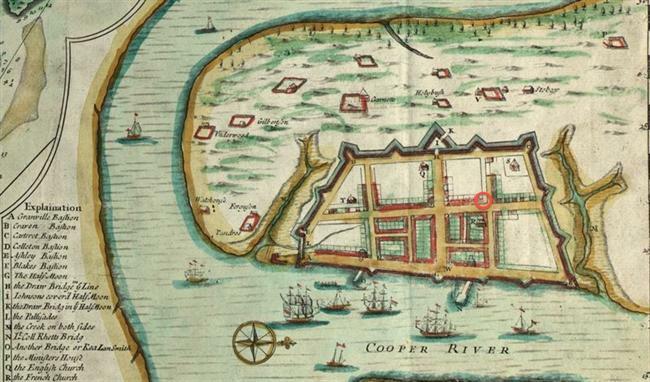 The "new theatre in Dock Street" opened in 1736, one of the earliest purpose-built theatres in America. That building was remodeled or replaced several times over the next four decades, then abandoned as a theatrical venue. Before 1809 it had been replaced by a large townhouse, which was used as a hotel until after the Civil War. In the late nineteenth century, the Planters Hotel became a warren of tenement apartments; by the early 1930s it was uninhabitable. Its conversion for theater use was one of many important WPA projects carried out in Charleston during the tenure of Mayor Burnet R. Maybank. 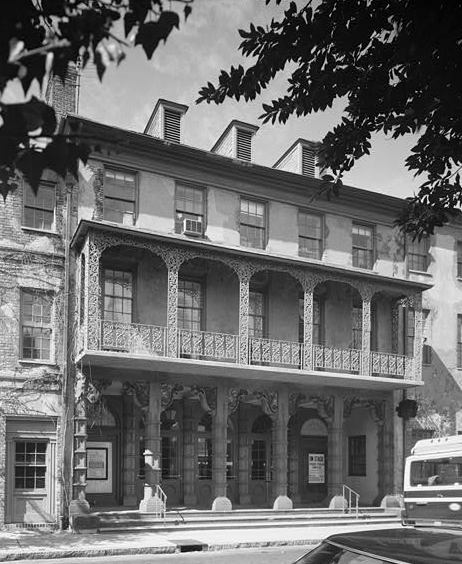 Advertised as "the new theatre in Dock Street" in the South-Carolina Gazette, Charleston's first theatre opened on February 12, 1736, with the comedy "The Recruiting Officer." The performers' identities have not been recorded; the lead actress assumed the name of Monomia, the character she had played the year before in the tragedy "The Orphan, or the Unhappy Marriage." Before 1736, plays and concerts were presented in the assembly rooms of taverns and in the Council Chambers above the Exchange Building. The promoters typically sold advance subscriptions, gauging their support before hiring musicians, actors, and halls for a series of winter performances. The first season in Charleston's theater lasted through May 1736, with advertisements sometimes referring to the "theater in Queen Street." Although the street has generally been known as Queen Street since that time, the twentieth century theater was named to honor its eighteenth century forerunner. The Dock Street or Queen Street theater seems not to have been revived after the American Revolution. 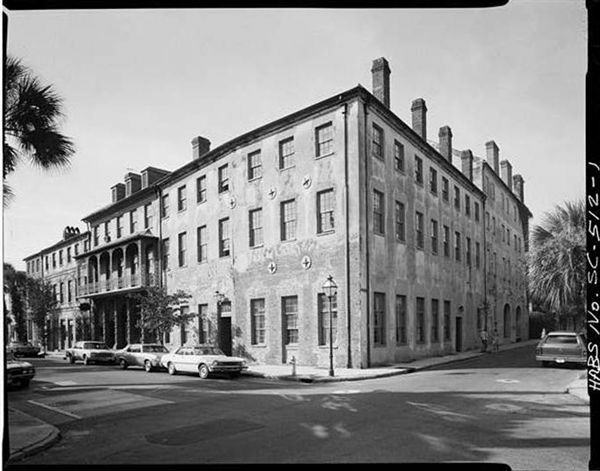 In January, 1809, Mrs. Calder, who operated the Planters Hotel on Meeting Street with her husband Alexander, placed a large ad in the Charleston Courier, informing her patrons that she had "purchased from Major John Ward the large and commodious house at the corner of Church and Queen street…. There is an excellent cistern of water on the premises, which gentlemen have complained so much of at the Planters Hotel." 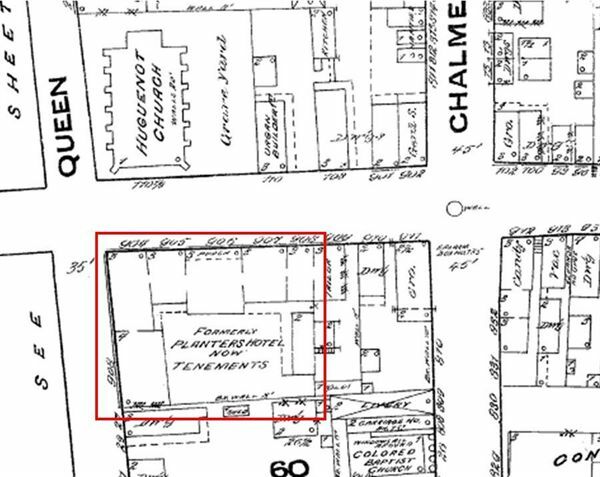 With the relocation of the Calders' business, the corner of Church and Queen streets became known as the Planters Hotel. The Planters Hotel retained its name during the tenure of innkeeper Orran Byrd, who added nine rooms and enlarged the stables in 1816. A few years later, Alexander Calder returned from a long trip to Europe and resumed business, informing his patrons that "there will be no tavern kept in the establishment, but servants will always be kept in waiting to procure such wines, etc., as the company may desire." By contrast, John C. O'Hanlon, who took over the Planters Hotel in 1852 and renovated the buildings, advertised that his bar room would be "furnished with the very best of wines and liquors, segars, &c."
In late 1855, the "Calder House" was renovated by J. W. Gamble, who is likely responsible for the grand Church Street entrance with its recessed porch, banded brownstone columns, carved wooden brackets, and iron balcony. The hotel reopened after the Civil War, but by 1884 the main building and rear service buildings had all become tenement apartments. In 1934, the property was in deplorable condition, the rear structures little more than "shells." In cooperation with Mayor Burnet R. Maybank, the New Deal agency FERA selected the Planters Hotel building as a model project for its "historical program." (FERA was supplanted by the Works Progress Administration (WPA), which completed the project.) The City of Charleston bought the property; the federal government provided funding and an architect, Douglas D. Ellington. Working with local architects Simons & Lapham, Ellington planned the conversion of the hotel building and adjoining structures into a new Dock Street Theatre. The theater's public rooms were outfitted with woodwork and plasterwork salvaged from the 1802 Radcliffe-King house on Meeting Street, which was being demolished [and was replaced in 1939 by the College of Charleston Gymnasium]. 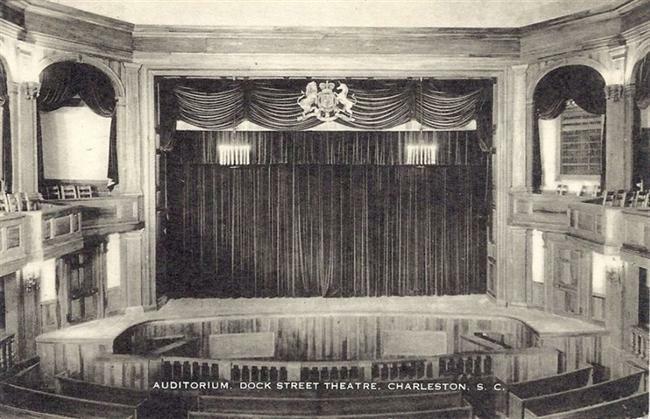 The new theater, named in honor of the original Dock Street Theater, opened on November 26, 1937, with a revival of The Recruiting Officer presented by Charleston's Footlight Players under the direction of Emmett Robinson. Still owned by the City of Charleston, the Dock Street remains one of Charleston's favorite theatres. After a thorough rehabilitation, with the plans and specifications of Evans & Schmidt Architects being carried out by NBM Construction, the building was reopened in the spring of 2010. Behre, Robert. "Dock Street face-lift on track." Post and Courier, 6/2/2008. Butler, Nicholas Michael. Votaries of Apollo. The St. Cecilia Society and the Patronage of Concert Music in Charleston, South Carolina, 1766-1820. Columbia: University of South Carolina Press, 2007. Charleston Courier, 10/18/1816; 10/20/1819; Charleston Daily Courier, September 8, 1852. Curtis, Mary Julia. "Charles-Town's Church Street Theatre." South Carolina Historical Magazine 70 (1969). "Dock St. Theater Will Be Modern." News and Courier, 11/23/1935. Fick, Sarah. "Dock Street Theatre." Walter Edgar, ed. South Carolina Encyclopedia. Columbia: University of South Carolina Press, 2006. "Our First Playhouse. Perhaps it was, after all, in Charleston, S. C." New York Times, December 15, 1895. Ravenel, Daniel. "Dock St. Architect." News and Courier, July 1, 1943. Eola Willis Material, The Charleston Archive, Charleston County Public Library. Williams, Harriet Simons. "Fair credit for Dock Street Theatre." The Post and Courier, April 14, 2010. In 1860, the hotel was known as The Calder House. Dock Street Theatre interior, postcard view. Location of Dock Street Theatre in 1711. Sanborn Company Fire Insurance Map, 1884. 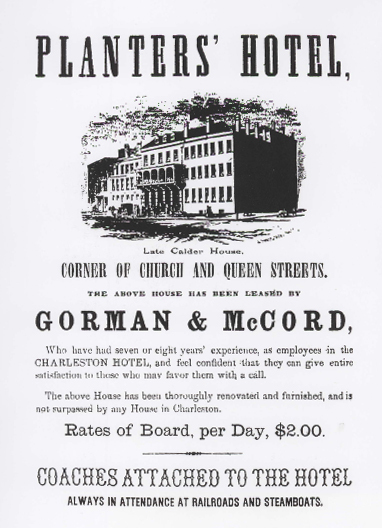 By 1884, the Planters Hotel and its service buildings had been given over to tenement apartments.